When I was 10 years old I got the Arena album as a gift from a cousin I deeply love. I used to listen to it nonstop, 24/7. I still have the album but since I no longer have a record player I bought the CD a while ago – I love listening to it while I drive to/from work. So good. The CD version has two bonus tracks, but unfortunately “Girls on Film” and “Rio” are songs I never cared about (and still don’t). Start by making the spiced hazelnut pastry: beat butter, icing sugar and orange zest in an electric mixer until creamy, add yolks and beat to combine. Add remaining ingredients and mix until just combined. Form into a disc, wrap in plastic wrap and refrigerate until firm (2-3 hours). Roll two-thirds of hazelnut pastry to 3mm-thick between two large pieces of lightly floured baking paper and line a lightly buttered 24cm (9in) diameter tart pan with a removable bottom. Trim edges, prick pastry all over with a fork and freeze until firm (15 minutes). Roll out remaining dough on a lightly floured piece of baking paper to a rough 24cm-long rectangle, place on an oven tray and refrigerate between the paper pieces until firm (15-20 minutes). Preheat oven to 180°C/350°F. 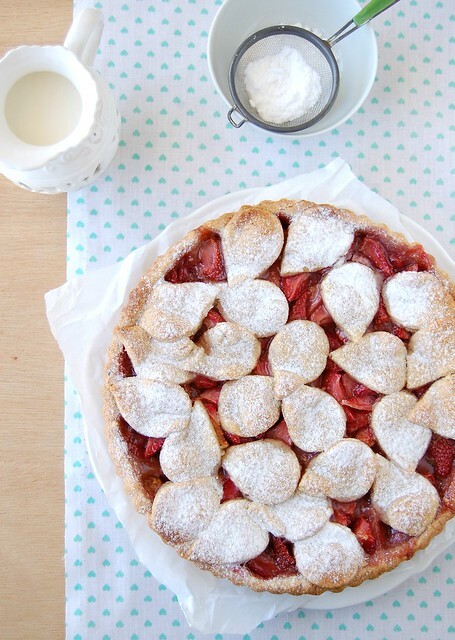 Combine strawberries, sugar, corn starch, zest, juice and vanilla seeds in a bowl and fill pastry case. Remove the pastry rectangle from the fridge, remove the paper piece on the top and cut the pastry into your favorite shapes using a cookie cutter (mine was a drop shaped cutter about 3cm long). Place them randomly over strawberry mixture, leaving some of the filling uncovered**. Brush pastry with heavy cream, place tart pan onto a baking sheet and bake until crisp and golden (35-40 minutes), cool completely in the pan over a wire rack. Dust with icing sugar and serve with crème fraîche. ** I gathered up the pastry leftover pieces and made slice and bake cookies with the remaining pastry – they tasted delicious! I have never made anything with rose water before, this tart is divine. your tart looks AMAZING!!!! I just wanna keep looking at it. Hi Patricia! I just have discover your blog and I think is wonderful. I like almost all your recipes, and I like the way you write your posts. I become follower, so I'll be back frequently. Love from Spain and have a nice weekend. This looks like such a special recipe...I love all the unique ingredients (and I share your love of rose water, especially with anything 'berry'). Love your presentation with the dough cut outs as well...all in all a VERY special post!